Start cooking something in the onion family. Pictured: chives. Strain 1 dozen shucked oysters to separate meat from juice (liquor). Add oyster meat to onions. Cook until the edges of the oysters start to ruffle. Add oyster liquor and 2 cups of milk and/or cream. Cook until broth steams but does not boil. Seasonings (very optional and often unnecessary) can include salt, pepper, smoked paprika, cayenne pepper, and celery salt. 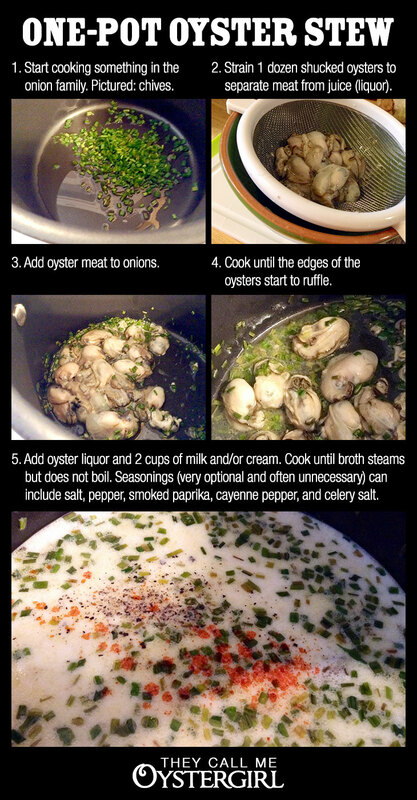 See also my traditional oyster stew recipe. Love the simplicity of this recipe!! !